Welcome! This little corner of Angel Grove is dedicated to Aisha Campbell, the Yellow Ranger. It took me a while to warm up to Aisha, as I'd imagine was the case with many fans. When she debuted on Power Rangers as part of the first cast changeover, I was totally attached to her predecessor, Trini, and was not ready to accept anybody else. However, Aisha quickly proved that she was not a "replacement Ranger," but an original and vibrant presence in the show. She was strong and spunky, never afraid to speak her mind, and a loving friend to her teammates. Her eventual departure from the cast was handled with dignity and grace, perhaps more so than any other cast transition in the series. 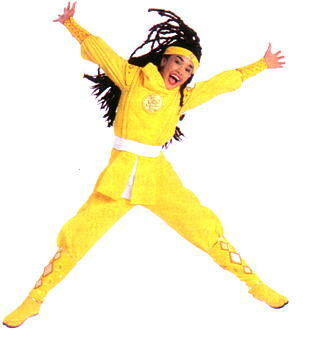 The Yellow Rangers who followed Aisha have had a lot to live up to. This was the first Aisha shrine on the Web when it first appeared in 1998, and even today sites for her remain scarce. If you maintain an Aisha, Karan Ashley, or Sicily website that I have overlooked, or if you've written Aisha-centric fanfiction, please e-mail me and I will be happy to link to you. This shrine is unofficial and not for profit. I am not affiliated in any way with Saban Entertainment, Disney, Karan Ashley, or Sicily Sewell. Latest News: Karan Ashley is starring in a new film with fellow Power Ranger Johnny Yong Bosch. Devon's Ghost will be released on video in May 2005. Click here for more information.